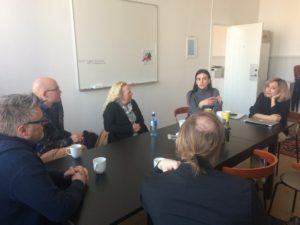 My name is Ani, I am a 24 years old girl from Georgia and I am the first European Solidarity Corps volunteer in KEKS office in Gothenburg, Sweden. The European Solidarity Corps is the new European Union initiative which creates opportunities for young people to volunteer or work in projects in their own country or abroad that benefit communities and people around Europe. I decided to look for EVS/ESC projects in Sweden, because since childhood, being raised up on Astrid Lindgren’s books, it was a dream of mine to explore Sweden not only as a t ourist, but as a local. So when I saw the ESC project at KEKS office in Gothenburg, I decided to apply immediately. I arrived in Gothenburg on 4th of February. It was snowing and my mentor Sara picked me up from the airport, from where we went to the place where I live now. A very nice Swedish lady welcomed me at home and gave me all the useful information about the neighbourhood. Then Sara took me to the KEKS office, where we talked a bit about my tasks and responsibilities and future plans. After that I met the rest of the staff members at KEKS office and we had a really nice dinner together. From the first minutes in Gothenburg it felt like home and I already knew that my 11 months ESC experience here would be unforgettable. The following week was quite fun and busy. At first I was a bit scared, but the friendly working atmosphere and helpful Swedes are another reason why I got acquainted with the new home country extremely quickly. In my first week in Gothenburg I went to two different Youth Centers and participated in the activities there. One was at Kooperativet Fjället, where I met my fellow ESC volunteers, who turned out to be super friendly and after working hours we went to have a dinner together! And the day after I went to 1200 Kvadrat, where I was filming the activities held in the Youth Center. It was my very first filming experience and I already knew that during my volunteering period in Sweden I’d get a lot of new skills. During my second week in Sweden I went to an on-arrival training in Stockholm, where I met another volunteers from different Swedish cities, and originally from all over the world. The on-arrival training was very helpful, we got the information about our rights and responsibilities, learned about Youth pass and non-formal educational methods. After the on-arrival training, I came back to Gothenburg, where we had quite a busy schedule. I started preparing my ideas and applying for the European Youth Week, which will take place during the period 29 April – 5 May. My everyday tasks include checking emails, uploading news and information on the KEKS website, always being in contact with KEKS Network organizations, make presentations about ESC, Erasmus+ and Youth Exchange programs and help young people from the youth centers to fill the application forms, if they want to take part in an exchange program. Alongside with these tasks, I am working on a short term EVS project in Thessaloniki, Greece, where we are looking for 2 Swedish or legally residents in Sweden who would like to spend 2 months in Greece volunteering and getting a lifetime experience. with the frameworks of this project, I made a presentation about our ongoing EVS project in Greece at different youth centers in Gothenburg and Stockholm and I helped the interested candidates to fill their application forms. I have a lot of up-coming projects and I can’t wait to share them with you on my later blog posts. For you to have a small idea, I am working on the project called EU Caravan, which includes me traveling around Sweden to KEKS network organisations, and making presentations about ESC and Erasmus+, I will also share my personal experience what it’s like to be volunteering all alone in a foreign country and perks of going for EVS/ESC projects abroad. My goal is to raise awareness about European projects and to help young people to get involved and participate in them! The European Commission thought that my project in Sweden is very interesting and invited us to participate in the European Youth Week in Brussels during 29-30 April, so we are very looking forward to it! Also, my project and events that I organized specifically for the European Youth Week in May, got funding from the National Agency in Sweden, which means that during the European Youth Week I will be traveling around Sweden to KEKS NETWORK member organizations and organize activities in order to promote Democracy, European elections and the importance of voting with young people! So April and May will be pretty busy and I can’t wait to start working on these projects! On top of it, I started learning Swedish, the classes take place twice a week and I am really looking forward to becoming fluent in Swedish. *Ani is presenting her project for Lund’s mobile team for youth work visiting the KEKS office.